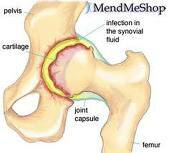 A septic hip is an infection within the hip joint. This is an uncommon problem, but it can occur in infants and young children. Septic hips are also called septic arthritis and infectious arthritis. 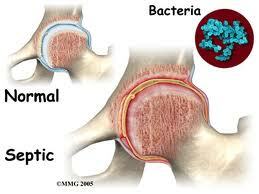 Children with a septic hip have bacteria within the hip joint. The bacteria accumulates as pus and becomes painful. Children with a septic hip require surgery to cure the infection. Treatment must proceed quickly to ensure there is no permanent damage to the hip joint. What are the symptoms of a septic hip? How is a hip infection diagnosed? Physical examination of the child is important to determine the location of the problem. If a hip infection is suspected, blood tests can assess for signs of infection and inflammation. X-rays are usually done to evaluate for problems of the bones around the hip joint. 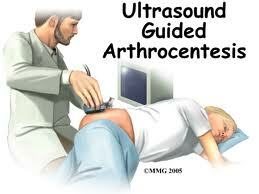 Other tests such as MRI or ultrasound may be done to see if there is fluid accumulating within the hip joint. If a septic hip is suspected, a needle is inserted into the hip joint. The fluid from the hip can be analyzed. If pus is seen within the fluid, an infection is presumed and surgery should be performed to clean the hip joint. If infection is not obvious, the fluid can be analyzed for evidence of infection. Other problems that are not as serious, such as transient synovitis of the hip, can cause similar symptoms as a septic arthritis. What is the treatment for a septic arthritis of the hip? Infections within the joint require surgery for treatment. The infection within the joint can damage the cartilage permanently. If an infection of the hip is diagnosed in your child, he or she will have surgery to clean out the joint. Timely treatment of a hip infection in a child is important. Because the hip is still growing, it is of utmost importance to protect the cartilage. Patients who sustain damage to their cartilage are risking permanent hip joint damage. These patients may require hip replacement later in life if the damage to the cartilage is severe. Sucato DJ, Schwend RM, Gillespie R. “Septic Arthritis of the Hip in Children J. Am. Acad. Ortho. Surg., Oct 1997; 5: 249 – 260.